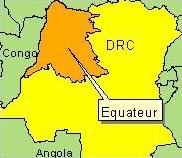 KINSHASA, 28 November 2007 (IRIN) - Authorities in the northwestern Democratic Republic of Congo (DRC) province of Equateur have imposed a nighttime curfew in the area until further notice in a bid to curb insecurity, including murder and extortion by armed men. "We want to stop rising incidents of insecurity," the governor of the province, Jose Makila, who announced the curfew on 27 November, told IRIN. The curfew between 11pm and 5am will apply mostly in Equateur's capital, Mbadaka, and other areas of the province where cases of murder and extortion have been on the rise, he said. "There are many armed men roaming about, especially at night, committing murder and extortion. They have not been properly identified, but we know there are at least 18,000 former rebels at large," Makila said, adding that gunfire was heard almost every night in Mbadaka and other areas of the province, with victims found dead in the morning. The majority of the demobilised rebels came from the Mouvement pour la Libération du Congo (MLC), an armed group headed by Jean-Pierre Bemba, who went into exile after the unrest that hit DRC's capital, Kinshasa, after he lost presidential elections to Joseph Kabila in 2006. A demobilisation, disarmament and reintegration process, which was initiated with the formal end to the civil war in the DRC in 2002, has not been completed. Military authorities in Equateur, however, denied that former fighters were behind the insecurity. General Michel Ekutshu, the army commander in charge of Equateur, said three officers from the national army had been arrested and would be tried for aggravating insecurity by selling ammunition to poachers operating in the Salonga national park in the south of the province.